But wait, you may ask. What's wrong with laptops? For the past decade, Apple has led and dominated the laptop market with design and innovation. The company has been moving toward better quality, so-called "Retina" screens. Apple’s keyboard designs and unibody aluminum construction have been heavily imitated. The company used to dazzle the industry by sweating the small stuff, like the MagSafe power connector and lights that shine through aluminum. It's not just that Apple innovated. It's that its laptop innovations evolved their products toward elegance and usability. And that's over. After years without a significant new laptop design, their latest release, last year's MacBook Pro, landed with a thud. The laptop was seriously underpowered — called by some a MacBook Air at a MacBook Pro price. The company ditched its incredibly popular MagSafe power connector in favor of USB C power. And that Touch Bar! Some like it, others hate it. Either way, the innovation turns away from elegance and simplicity toward awkward interface design and complexity. Most reviewers and users either hate the Touch Bar or like the Touch Bar, but few love it. The keyboard is a mixed bag. Its short key travel thrills some and annoys others. And the touchpad is way too big. Users report constant accidental taps. Apple's attempt to be more elegant and minimalist has had the opposite effect. By offering only four USB C ports, the laptop itself has become simpler. But USB C requires the user to buy ugly, awkward, easy-to-lose dongles and adapters for all those devices and media we use that don't support USB C. Yuck! The best thing that can be said about the MacBook Pro is that it's faster and has a better screen than previous models. But this is inevitable and expected, not revolutionary. There's nothing about this laptop that's going to drive the industry to imitate. Rivals are more likely to see the new MacBook Pro as an opportunity to provide something different, not something similar. Most importantly, is the MacBook Pro worth the price? We'll get to that question in a minute. But first, let's look at all the trends happening this year that conspire against the laptop in general. The U.S. and U.K. governments recently banned all non-medical electronic devices larger than a smartphone as carry-on for U.S.-bound flights on specific airlines from specific airports in the Middle East and North Africa. Passengers are required to check their laptops. The ban may have been implemented in response to two recent laptop bomb explosions — one blowing a hole in an airplane flying from from Somalia to Djibouti and the other wounding six people in a Somali airport. These events coincided with intelligence chatter finding increasing sophistication by Al Qaida in building laptop bombs. One congressman said at a recent security conference that more countries would be joining the ban. There are several assumptions we can make about the ban. First, like so many security measures, the ban may spread globally and eventually include all flights. For the next few years, it may become impossible to use a laptop on a commercial flight. Second, such a ban will affect laptop sales. Many travelers won't want to place an expensive laptop in checked luggage for fear of loss or theft. The general fear, uncertainty and doubt around laptops on airplanes is enough to change consumer behavior. And the frequent flier is the laptop industry's best customer base. Third, the ban will be an incentive to develop alternatives so passengers can travel without laptops. Samsung announced this week its upcoming Galaxy S8 and S8+ smartphones, and the public is impressed. But even more impressive is a Galaxy S8 peripheral called the DeX Station. The DeX is a smartphone dock into which you plug a keyboard, mouse and monitor. DeX enables you to use your Galaxy S8 as a desktop PC. (Instead of a monitor, you can also plug in a TV or projector.) The dock outputs at a 4K resolution, and it supports Ethernet for faster connections. I expect some of you business users to buy two — one permanently installed in your office and another in your home office. 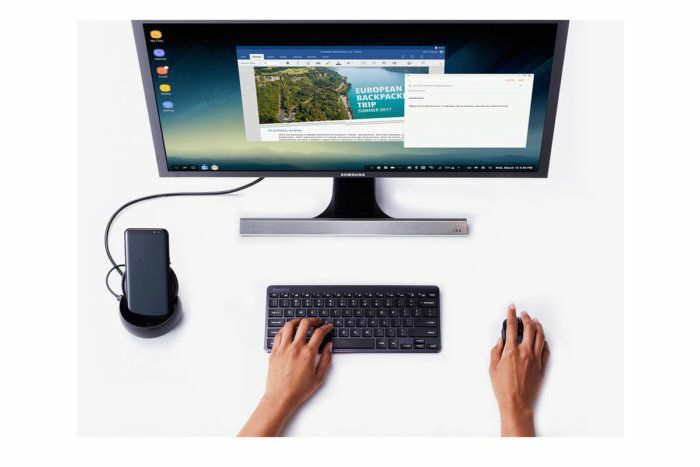 That would enable you to use your smartphone full time as your only device, even as you benefit from the giant screen, full-size keyboard goodness of a desktop PC everywhere you work. You can take it with you on trips, and use it in hotel rooms to plug into the room's big TV. Years ago, the use of a phone as a desktop PC wasn't practical. But now, thanks to the cloud and the emergence of strong, even enterprise-capable apps for Android phones, a smartphone docking setup makes perfect sense. The DeX Station costs $149.99 and ships in late April, according to Samsung. At that price, you still can get a bigger screen and better keyboard than what you get on a laptop, and at a fraction of the price — even if you have to go out and buy a monitor, keyboard and mouse. It's possible that even Apple may get into the docking racket. Apple last week published a patent application for a clamshell laptop-like device that runs off an iPhone. The iPhone is inserted in the same spot in front of the keyboard where the touchpad now sits on a MacBook Pro. The phone not only powers the device entirely, but you use the iPhone's screen as the touchpad. This would give you the laptop experience without the laptop price. Better still, you'd use iOS instead of OS X, and could use a single device for everything. You can bet that if Samsung and Apple are enabling the use of smartphones instead of desktops or laptops, the rest of the industry will do so as well. In fact, a small company called Andromium, which makes the Andromium OS (an app that gives Android the look and feel of a desktop OS) is offering for pre-order something called the Superbook. It's a $129 laptop-looking "shell," that's powered by an Android phone. I think the practice of docking in general, and docking a smartphone in particular, will go mainstream fast. Docking isn't a new idea — even docking a smartphone isn't new (consider Microsoft's Continuum, for example). What's likely new is the embrace of docking as a mainstream alternative. Here's another old idea that's about to go mainstream: clamshell smartphones. In 1997, a company called Psion perfected the so-called personal digital assistant, or PDA. Psion did this through amazing industrial design. The Psion Series 5 had a surprisingly large and touch-typeable keyboard. Sadly, this perfection was washed away by the rising mobile phone movement, which replaced PDAs. Now, the same designer who created the Psion Series 5, Martin Riddiford, is re-creating it as a dual-boot Android and Linux smartphone called the Gemini PDA. He's designing it for a company called Planet Computers. While closed, the Gemini PDA can be used as a phone. While open, it can be used as an Android smartphone with a built-in keyboard — or a Linux laptop that fits in your pocket. In fact, the smartphone-size PC idea is emerging more generally, including in the gaming space. Even Apple has a patent for a clamshell iPhone, which uses a bendable screen. If users want a physical, touch-typeable keyboard, in other words, they won't need a laptop to get one. All these alternatives provide incentives to use smartphones instead of laptops. And there are three more trends — the last of which will close the lid on laptops once and for all. The first fatal trend is that young people are already choosing smartphones over laptops, even without docking and clamshell smartphones. ComScore reports that the use of laptops and desktops among younger people is on the decline. Some 20 percent of millennials use their smartphone as their only computing device, according to a recent report, and this percentage grows each year. Raw demographics alone favor the end of laptops. The second fatal trend is that the industry is champing at the bit to move everything off Intel and onto ARM. (Intel and Intel-compatible chips have powered desktop and laptop platforms for decades; the smartphones and smartphone apps run on ARM chips.) Once laptops, especially laptops from Apple, run ARM chips, they'll run iOS and Android instead of OS X and Windows. And at that point, they'll essentially be identical to docking solutions, but more expensive. The third and final fatal trend can be found in your wallet. Smartphones are becoming amazing. The Galaxy S8 is amazing. And this year's iPhone is expected to be mind-blowing as well. The new phones have cameras that rival DSLRs. They have performance that rivals desktop PCs. They run increasingly amazing apps, including professional-quality apps. Unlike laptops, smartphones are exciting. Consumers will pay this amount because smartphones are worth it. This is especially true if they don't have to shell out $1,500 or more for a laptop as well. Laptops are too boring and expensive. The industry is churning out new designs that enable smartphones as laptop replacements. Young people are favoring smartphones. The industry wants to use smartphone OSes. And consumers are spending more on smartphones, which will make us spend less on laptops. The dominance of laptops is over. You may never buy another laptop. This story, " The laptop is dead" was originally published by Computerworld.